Stars are not only fascinating objects in their own right — they also help us understand the history of our Milky Way galaxy. Our galaxy was created as dark matter’s pull brought gas together, and the gas formed stars and planets. 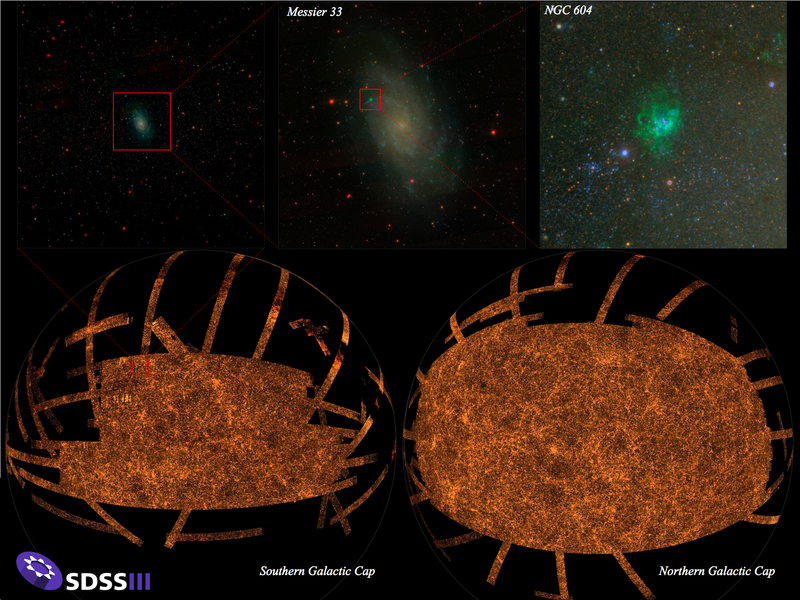 As part of the APOGEE survey, we wish to map the Milky Way’s star formation throughout cosmic time. As stars died, many of the elements they fused in their interiors during their lives or death throes are mixed back into the remaining gas, changing its composition and the composition of subsequent generations of stars and providing the raw materials for planets (and humans!) and we are exploring this chemical history as well. A small part of the spectra of a few of the stars observed by APOGEE. The dark lines are caused by absorption of atoms in the star’s atmosphere (or sometimes the Earth’s). A few of them are highlighted. The bright lines are caused by emission in the Earth’s atmosphere (“night sky lines”) These particular stars have also been observed by the Kepler satellite. APOGEE studies stars by passing their infrared light through gratings that spread the light out in wavelength (think infrared rainbows). We do this for > 250 stars at once (one of the reasons why the APOGEE instrument is fantastic). We can tell a lot about stars from studying these spectra. For example, in an earlier blog post, we discussed how we can tell the surface temperature of stars from such data. Another very important property is the composition of the star, for example, how many atoms of iron, calcium, or oxygen it has relative to hydrogen. The image to the left shows a small part of the spectra we gathered for stars that were also observed by the Kepler satellite. The stars do not give off the same amount of light at each wavelength (=color) of light. Instead, there are many dark lines, which are created when atoms in a star’s atmosphere absorb light at very particular wavelengths. Each element has a different pattern of these absorption lines, and by measuring the depth of these lines (+ additional information and math), we can determine the composition of the gas out of which the star formed. But this doesn’t tell us everything about the star! In particular, we can’t see inside the star where the original composition of the gas is being transformed from hydrogen into helium as the star ages. We have a good idea of how long it takes for a star with a certain mass and original chemical composition to run out of fuse-able hydrogen in its center (about 10 billion years in the case of a star with the mass and composition of the Sun). When that happens, the star undergoes a dramatic change, turning into a red giant or supergiant. So if we can determine the mass to go with the spectral composition information for red giants that we observe, we can determine the age of those particular stars. Measuring the mass of a star is hard work, but one possible technique is to use asteroseismology, which is the study of the waves that move through stars. In the outer parts of stars, these waves are actually sound waves that can evocatively be described as ringing the star like a bell (For more information see The Song of the Stars). The motions of these waves cause a star’s brightness to change by small amounts, and thus the frequency of these waves can be measured by studying the lightcurves of red giant stars. The Kepler satellite, in addition to studying many Sun-like stars looking for transiting planets, also measured the brightnesses over many years of thousands of red giants. The favorite frequencies of waves in different stars have been measured by members of the Kepler Asteroseismic Science Consortium. While much can be learned about the insides of stars from these data, we are particularly intrigued by the fact that how long and at what speed waves can move through the star depends on the star’s density and therefore (with some more math) its mass! Combining together spectra from APOGEE and lightcurves from Kepler therefore gives us a way to figure out the ages of red giant stars in our Galaxy by measuring the masses and composition of stars that have just exhausted their hydrogen. In conclusion, songs and rainbows are good things.